Freezing temperatures - perfect for a mountain snowmobile ride.. 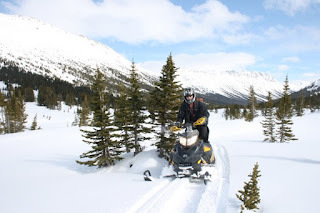 The temperature had crept just above -1c when we woke up and with fresh snow littering the trails, it provided us with great conditions to get on the snowmobiles and tear through the untouched powder. We started on our journey to Mud Creek taking a break on the way to absorb the views of Dixon and Eldorado Peak, the bright blue skies creating quite a contrast with the cold white snow beneath our feet. In the afternoon we decided to head over to Carrol Lake where we discovered that our sleds would not be the first things to pass through the newly formed powder, a wolf had beaten us to it and imprinted it's tracks in the snow. Sunset was quickly approaching as we made our way back to ranch and we couldn't help but feel that another amazing adventure had passed too quick. Our mountain snowmobile adventure was over, but we will never forget it! The full moon was shining brightly last night and it was -4. We woke up to the smell of breakfast and a cozy warm room. Leaving an empty plate and the warmth of the house, we snowmobiled up the trail to Relay and around to Marshal Lake for lunch. On the way we saw a lynx (lynx are very elusive creatures and we are very lucky to spot one) that stopped just off the trail to pose for a picture. Our Brett camp was our destination for the afternoon, for hot chocolate, a quick snack and a rip though the alpine bowl. A hot meal, video's of the day's rides, a warm fire at the ranch was the evening's list of activities.